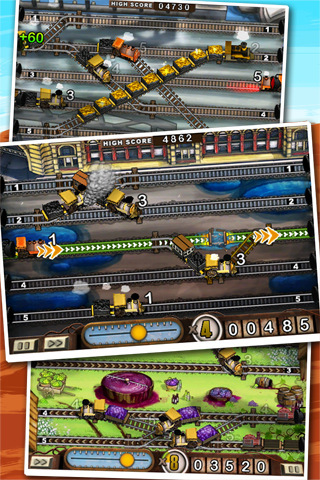 Train Conductor for iPhone is a fast moving game that lets you start your foray into moving trains and helping locomotives get places. Conceptually the game is simple. The screen is filled with a set of numbered train tracks and it’s your job to swipe them to their final destination based on the corresponding numbers on top of each moving train. The game starts in Alice Springs on easy mode. You end up swiping trains back and forth on three different tracks, tapping on them to stop them temporarily, and then tapping again to start them on their way. If the trains crash you have to start over, but for every train you deliver successfully, you’re given experience. Once you have enough experience you can head over to other locations throughout Australia. In Cairns you end up learning about delivering ghost trains and Sydney moves the game up a notch in the difficulty department because the trains get longer and they start to jet through the screen with more frequency. 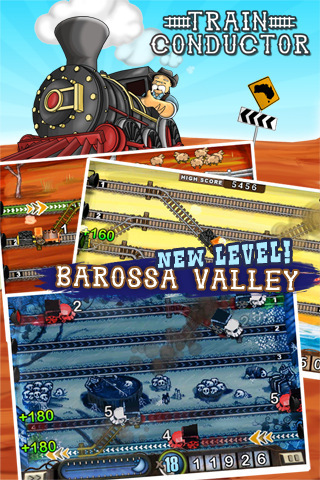 With every passing level the game becomes more difficult, but Train Conductor does a great job of introducing you to new intriguing elements gradually. Graveyard shifts take you through heart pumping speed modes, but the ghost trains you must deliver can’t crash so the game is a little different without being too difficult. With each passing location the landscape is a little different, but the game is fundamentally the same. You can switch between day and night modes in the upper right hand corner of the main menu map, and always get fun twangy outback music. 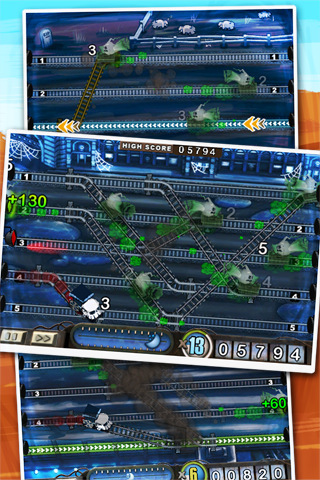 What’s best about Train Conductor though, is the way that it plays to the iPhone as a gaming platform. It’s easy to get caught up in but also easy enough to leave. If you have to step away in the middle of a session you just press pause and choose “End Shift.” The time you’ve logged will still show up as experience that contributes toward your next level, meaning this is a great game for those in between times whenever you have a spare moment. To add to the fun, Train Conductor’s controls themselves are excellent. This is an extremely polished game and one of the best free titles I’ve played in a long time. 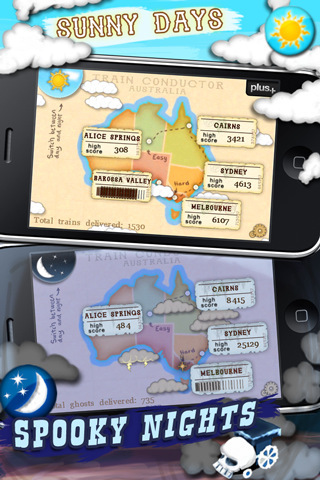 Bottom Line: Train Conductor is an addictive game with an easy premise and polished finish. Easy to jump on board and perfect for the iPhone.